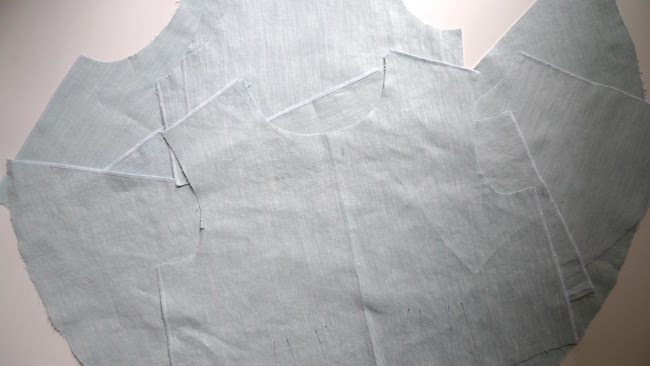 You have the choice of whether or not to add a lining to the bodice. My suggestion is that, unless you are very confident sewing a lining, and you think it is necessary for your fabric, I wouldn't add one. The reason is the "critical line" at the front of the bodice - if the lining isn't absolutely perfect, it could interfere with how the centre front pleats fall in relation to eachother... and we are going for perfect symmetry here! 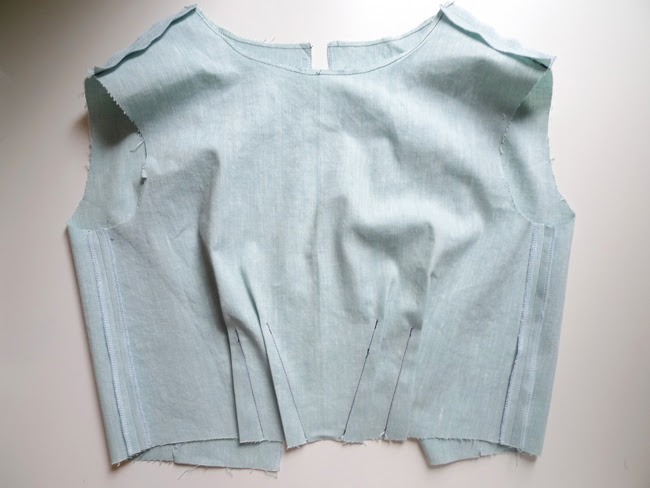 If you are not lining your Athena Top, start off by finishing some of the straight raw edges - the shoulder seams, the side seams, the centre back - but not any of the curved seams or waist seams. You can do this with a zig zag stitch or with your overlocker. You may prefer to add bias binding tape to the peplum side seams as the underside might show when wearing. 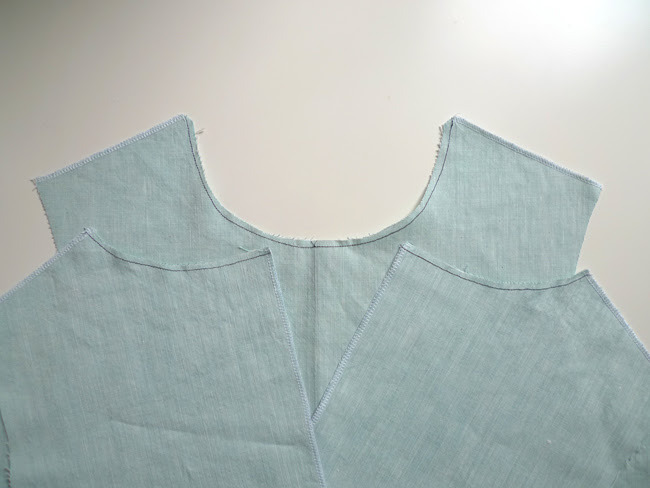 Now, stabilise the neckline by sewing a line of stitching inside the necline seam allowance. You want to use a short stitch length - about 2mm. 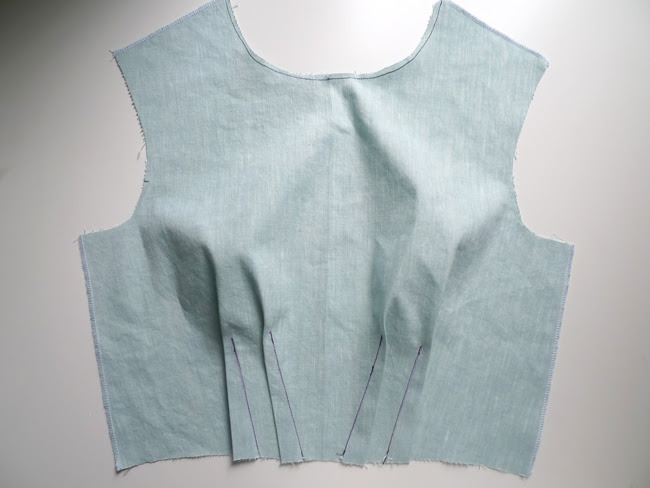 Sew from the shoulder seam, stopping at the centre front (or back) and repeating on the other side. 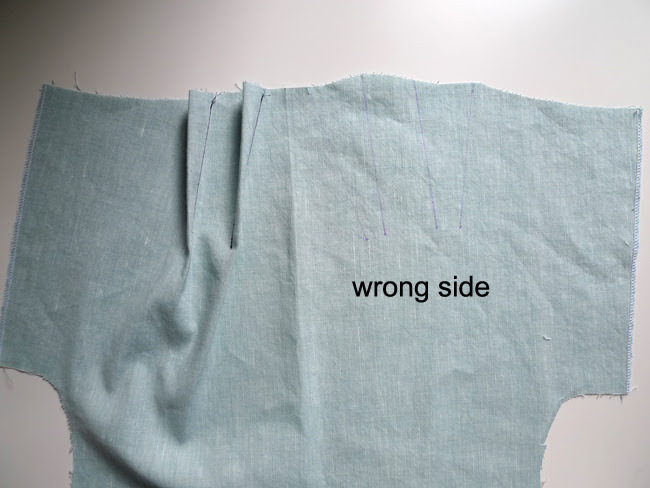 If you are sewing a lining, repeat this step for the bodice lining, too. Place the bodice worng side down, with the waist seam away from you. Starting with the pleat furthest to the right, insert pins pointing towards the waist, along the stitch line. 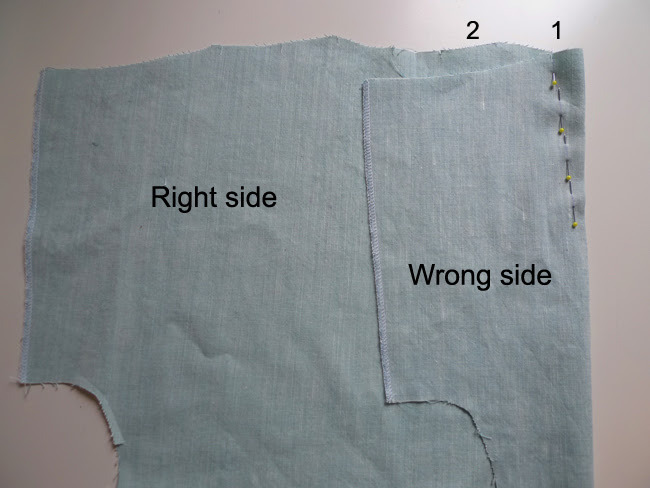 Stitch to secure from waist to end of pleat, with the wrong side down on your sewing machine and in the same order (yellow pins followed by red pins). 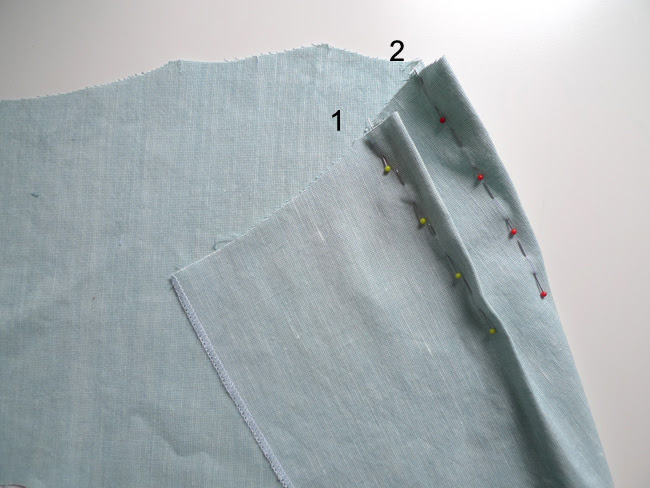 Tie off your thread ends or backstitch at the end of the pleat. 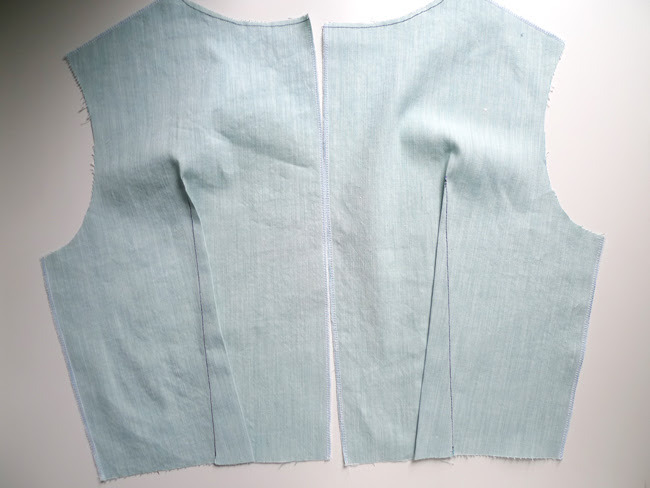 Now place the bodice right side down (wrong side up), with the waist seam still away from you. 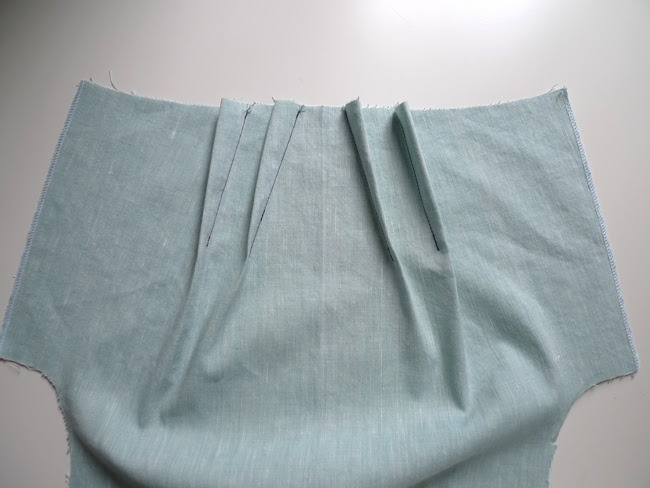 Of the remaining two pleats, pin the pleat closest to the centre front in the same way as the others (pin to waist). Repeat for the remaining pleat. Stitch in place to secure, in whichever order feels most comfortable to you. I like to start with the pleat closest to the centre front. Press all pleats away from the centre front and towards the side seams. Repeat for bodice lining, if lining. Stitch darts from waist to tip, tying off or backstitching a few stitches at the dart tip. Press darts toward centre back. With right sides together stitch the bodice front to the bodice back at shoulder and side seams. Repeat for lining, if lining. Next we add the peplum and we can see the full shape come together!